The rapidly expanding industry of cannabis cultivation has led to inquiries regarding controlled environment chambers for processes in this field. Darwin Chambers provides cannabis drying rooms designed for the replicable drying of cannabis. The drying process is critical to maintaining proper levels of cannabinoids and preventing mold and mildew. 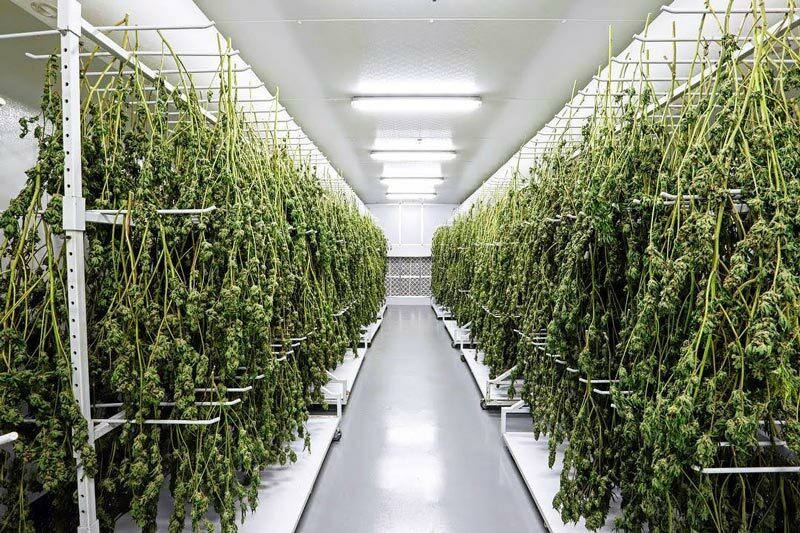 Darwin Chambers manufactures and installs cannabis drying rooms that can vary temperature, additive humidity, and dehumidification at programed (ramped) levels. This enables lot to lot consistency whether the drying happens in humid, coastal areas or dry, high altitude areas. Product can also be stored long term with precise levels of humidity to prevent mold or brittleness. Generally, it is recommended to keep the drying temperature between 16 and 21°C because many terpenoids (molecules that are partially responsible for the psychoactive effects but also largely responsible for the odor of the plant) evaporate at temperatures beyond 21°C. Non- programmed drying humidity levels should generally be between 45-55%. Higher humidity levels are associated with mold. Lower humidity levels tend to dry the products too quickly. If the plant material dries too quickly, some of the chlorophyll will fail to be converted which will result in a sub-optimal taste and a harsher smoke when combusted and inhaled. While some customers will follow the above guidelines, others will want to program increased drying at some times and/or more humidity toward the end of drying using the microprocessor’s programming features. Darwin Chambers utilizes a proprietary method of cooling, the PFTCU, (precision fluid temperature control unit) to precisely control temperature. Unlike typical refrigeration units, the PFTCU enables fast replacement (30 minutes) of all cooling components as well as redundancy when ordered as such. Stable temperature preserves cannabinoids well. Low light levels are also important for proper drying of grown plants. Darwin Chambers offers options to control light levels along with many other chamber options including: Black out strip curtains (to prevent unwanted light infiltration when people must enter the chamber), data loggers, chart recorders, shelving and curing racks. Quality – All of our products are designed, manufactured, and installed by factory personnel or factory-trained personnel, with an acute understanding of the needs of the pharmaceutical industry. Quality is reflected during all phases of a project, from initial quotation, through installation, and after years of operation. In our opinion, when considering all potential costs for both our customers and our company, quality is clearly not an option, but rather a standard. Speed – We stock nearly all components necessary to build standard, or reasonably custom, chambers in a very short period of time. All major components to each room are tested prior to shipment. Our temperature control systems are pre-charged, tested, and wired for exceptionally fast on-site installation. We consolidate shipments, where possible, to save on shipping costs, reduce shipping problems, and smooth overall installation logistics. Where competitors often call out 6 month lead-times we may call out 6 weeks or less. Performance – Utilizing an effective blend of the most trusted and recent technologies available has allowed us to design and produce what we consider to be the highest performing walk-in stability testing chamber. We excel in the actual calculated electrical efficiency of each room using high efficiency EC (Electrically Commutated) fan motors, high performance 4” polyurethane foamed-in-place panels, UV-disinfected ultrasonic humidification, and our unique PFTCU (Precision Fluid Temperature Control Unit). On-site validation services that have included multi-point temperature and humidity mapping have repeatedly proven nearly unbelievable uniformity and control results that far surpass FDA/ICH/GMP guidelines. Price – All of the most exciting technologies in the world do not mean anything if the price is not within budget. Our chambers exceed performance specifications while lowering cost projections. We, like many other manufacturers, feel price increases on everything from materials, to fuel, to health care and yet have still succeeded in maintaining truly reasonable pricing. We are tirelessly engineering better solutions that improve our product performance, reliability, and price. We believe there are many considerations to include in our price view, including: initial installation costs, electrical efficiency, lost “down” chamber time, service costs, and testing results. This allows our technicians to set each system in place quickly and reliably. Because there are no refrigeration lines to braze, there are no fire risks, no “burn permits” needed, and fewer opportunities for errors in the field. Each conditioning system can be replaced very quickly in the future due to simple water-type connections. This ease of installation/removal also allows for greatly simplified future relocation. A glycol/water hydronic heat exchanger in each of our drying rooms operates at very low pressure (0 to 10psi) and the fluid escapes far slower from small leaks than pressurized refrigerant gas. If a leak ever develops in the hydronic coil, the system can be immediately brought back on-line with the addition of more fluid by any available technician with no down- time on the chamber. Permanent repair of the hydronic coil can take place very easily at nearly any point in the future. In contrast, typical refrigeration evaporators operate at high pressures (60 to 120psi) and the refrigerant escapes quickly through even microscopic holes, rendering the system rapidly inoperable. A trained refrigeration technician must be able to be brought in, find the leak, fix the leak (if possible), assess the condenser for moisture damage, replace the system filter, pull a vacuum on the repaired system, recharge the system to the required specifications, and verify operation. These types of refrigeration repairs are exceptionally costly and incredibly time consuming. Even after refrigeration repairs are conducted, it is often nearly impossible to determine if the system has been compromised. To paraphrase, the differences between the two types of thermal control systems is stunning. Our entire cooling and heating package can be swapped out with a new unit, if ever needed, in minutes rather than the days (or weeks) needed to fix a conventional system. In addition to the time benefits, non-certified technicians can perform the above equipment swap in contrast to conventional systems that require certified refrigeration technicians. Our drying rooms that include an optional redundant refrigeration system allow uninterrupted operation upon a refrigeration failure. The room does not need to be taken out of service during repair, as the failed system can be isolated and serviced with no impact upon the chamber operation. All installed instrumentation is calibrated to NIST traceable standards and provided with a calibration form. In-house, factory calibrations are performed using state-of-the-art equipment with great accuracies. These reports are three-point verifications, traceable calibration documents.